BCDS Group has been appointed by leading labeling automation manufacturer FOX IV Technologies as their master distributor for Australia, New Zealand and the Pacific Rim region. “FOX IV’s automated print and apply labeling systems have been a reliable addition to Australian manufacturing facilities for the past 20+ years,” according to Rick Fox, President and CEO. FOX IV systems will be offered through ALS (Auto ID Labelling Solutions), a BCDS company, which is headed up by Bill Boursianis who has had more than 10 years experience with both FOX IV products and other printing and labelling equipment. Over the past 20 years, more than 1000 FOX IV print and apply systems have been installed in Australia. BCDS will provide parts and service for existing FOX IV equipment as well as supply new FOX IV equipment, including the 2010 Series and FOX IV’s innovative Zebra based print and apply systems. Founded in 1982, BCDS have integrated barcode, auto-ID and RFID systems successfully within all states throughout Australia. With our main office located in Sydney, New South Wales, we operate on a national and international scale. Our business stretches nationwide including Brisbane, Melbourne, Darwin, Perth, Adelaide and Tasmania. We have also provided our automated data capture solutions internationally to Macau, Mongolia, Indonesia, Philippines, New Zealand, Ireland, Malaysia, Singapore, Slovenia and Croatia. Certified with ISO9001:2008 Quality Standards, we ensure that our solutions surpass industry quality standards. This provides our customers with quality Auto-ID and RFID solutions that ensure a minimized total cost of ownership. FOX IV Technologies, Inc., has been an innovator in the automated labeling and coding industry for over 30 years. 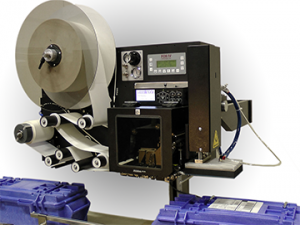 They offer a full line of label printers and applicators, ribbons, labels, enclosures, printing supplies and services, material handling equipment and software solutions in order to provide fully integrated turnkey automated identification systems. The company integrates more than 20 tabletop printers and OEM print modules into rugged label printer applicators capable of operating 24/7 in a wide variety manufacturing environments. Known internationally for innovative designs, quality construction and customized solutions, FOX IV is located approximately 20 miles east of Pittsburgh, Pennsylvania, USA.